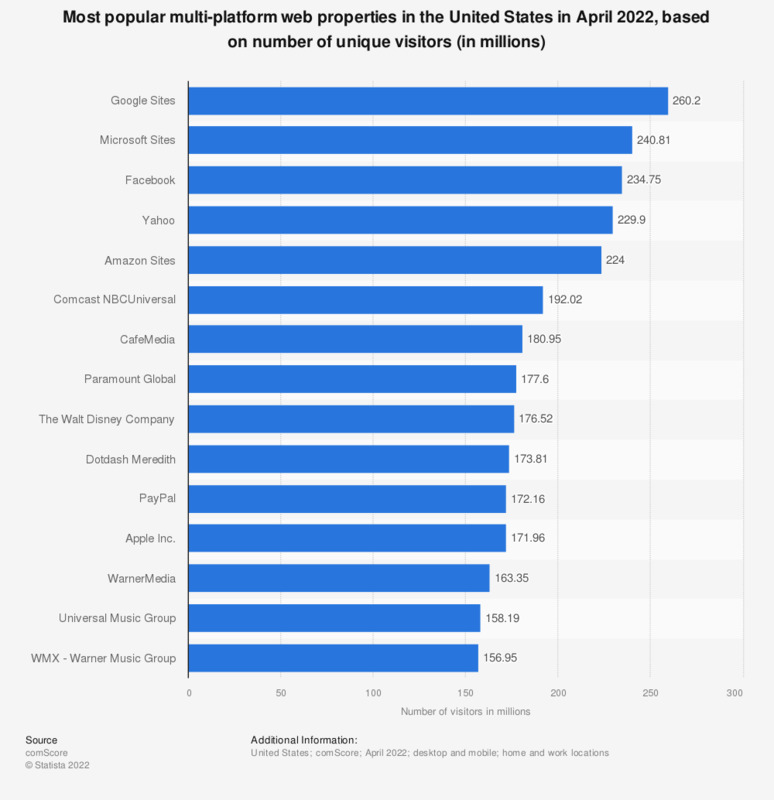 This statistic shows the most popular web properties in the United States in December 2018, based on their number of unique visitors. During that month, Microsoft sites had 205 million unique multi-platform visitors. Google Sites were ranked first with 245.8 million visitors from mobile and desktop connections – popular Google online properties include not only Google Search but also online video platform YouTube, communication services such as Gmail and Hangouts, as well as assorted online services such as Apps and Maps as well as digital app distribution platform Google Play. Leading online properties also include online shopping sites and media outlets. Lifestyle audiences in the United States have become increasingly mobile and frequently accessing lifestyle content via mobile browser or apps. The most popular social network in the United States based on multi-platform audiences is Facebook. As of January 2019, the majority of Facebook users in the United States were between 25 and 34 years old. Everything On "Amazon Prime" in One Document: Edited and Divided into Handy Chapters. Including Detailed References.